Whenever I go to St. Augustine I try to stop at the Vilano Boat Ramp to look for birds. I've always loved this little building at the ramp and its wonderful colors. I've thought of painting it but buildings scare me, LOL. However I was there a couple weeks ago for an Audubon meeting and stopped at the boat ramp. It was a dark and stormy day with clouds gathering, and the bait shack looked lonely. I took a few photos and decided I had to paint it this time. It felt like it would be cramped in my usual 8x10, so this is much more a panorama at 10x20. Done in acrylic. My nephew Scott and his girlfriend Tara just became proud homeowners last week. In fact the closing occurred on Scott's 30th birthday. What a birthday present. 😀 I decided to paint their house as a gift, but the real estate listing showed the house in winter snow. So then I checked it out on google earth, and used the springy image there as my reference photo. This is acrylic, my fairly standard 8x10.! Today was experiment day. I've been loving my acrylics, but have heard a lot about the newer water-based oil paints as well. I was curious about them, and when I was at Michael's yesterday they had a small introductory set for 40% the regular $24.99, so I decided to splurge! Only six paint tubes and not necessarily the colors I would have chosen. If you are going to provide only six paints do you really need both a yellow and a yellow ocher! And this is just an experiment. I tried them today and created the above, 8x10 on canvas. Definitely just a quickie and tomorrow I may make changes, but an interesting experiment. Last night I spent the evening painting a violin top for an Art Guild project. I finally got as far as I could go but still had some wet paints on my palette. I also had a small 8x10 canvas with me, so I got it out to just paint on it to use up some paint. So the painting above is what I wound up with. Just a quick 20-minute effort using what I had on my palette. Not anything special, but I love beachy scenes. Thanks again to my friend Leslie for inviting me to her studio, forcing me to try to paint! This is the image from last night, another 8x10 acrylic. I started these owls two weeks ago on an 11x14, and they were so awful I just painted over them and did the painting just before this one instead. The reference is from a photo I look at Fort Mose in 2015. 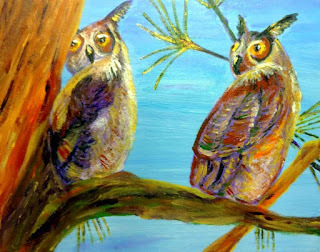 I had heard through the birding grapevine that a pair of great horned owls had been spotted there. When I got to the park I could hear them hooting, but while I looked high and low I could not see them anywhere. What I did see was a man with binoculars and a camera with a giant foot-long lens hunting around also. My lucky day I guess as he said he'd been coming every day for over a month looking for the owls, and this was the first day he'd seen them. I've been wanting to paint them ever since but only now got around to it. Wednesday I went to my friend Leslie's studio again, which is always fun, and makes me get out and do some sort of artwork even if I'm not feeling overly inspired. I started on a different painting which I hated more and more as I went on, so I finally took the colors on my palette and just wiped them back and forth all over the canvas. As I did it seemed a scene began to appear so I just pushed to emphasize it a little further. And that's how I wound up with this painting - not great art but something that felt very theraputic to work on. Acrylic, and slightly larger than I have been working lately, at 11x14. 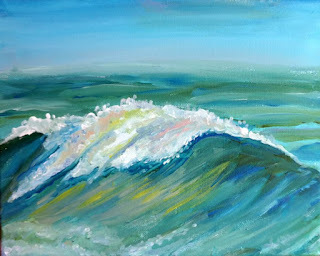 This was the second painting I did at my friend Leslie's house the other evening - another small 8x10 acrylic. I've decided I like this size. Small enough that you can finish something up in a reasonable amount of time, but big enough to be able to get in a big of detail if you want. The bird looks a tad portly, even after slimming it down quite a bit! Still, came out better than I had hoped. Thanks to my friend Leslie for inviting me to her studio, helping me get out of the rut I've been in. I actually did TWO paintings at her studio, both smallish 8x10 acrylics. 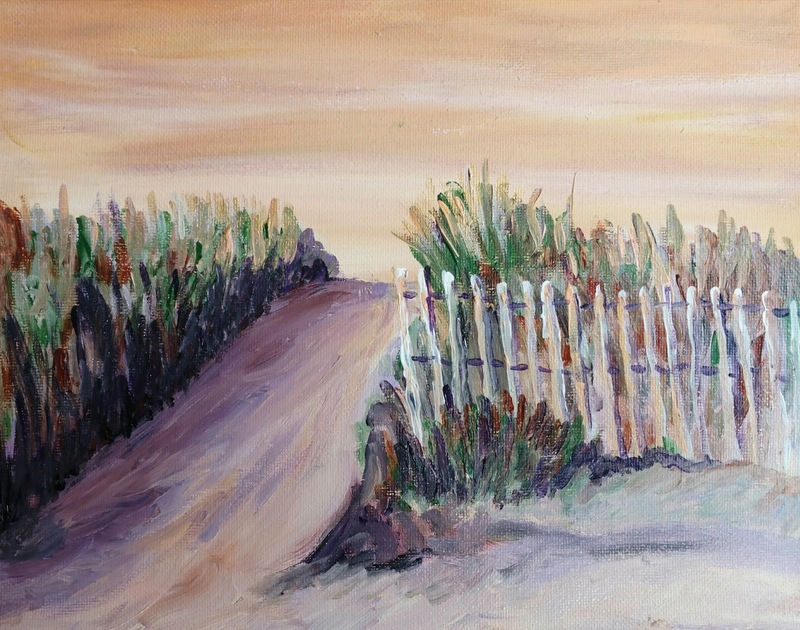 This is the first of them, done from a reference photo I took some years back of the beach shortly after sunrise in Cape May, New Jersey. This is a little acrylic I did tonight, trying to use some of the things I learned a couple weeks ago in the Gloria Clifford workshop. That one was based on sea turtles of course, but I have no pictures of sea turtles! 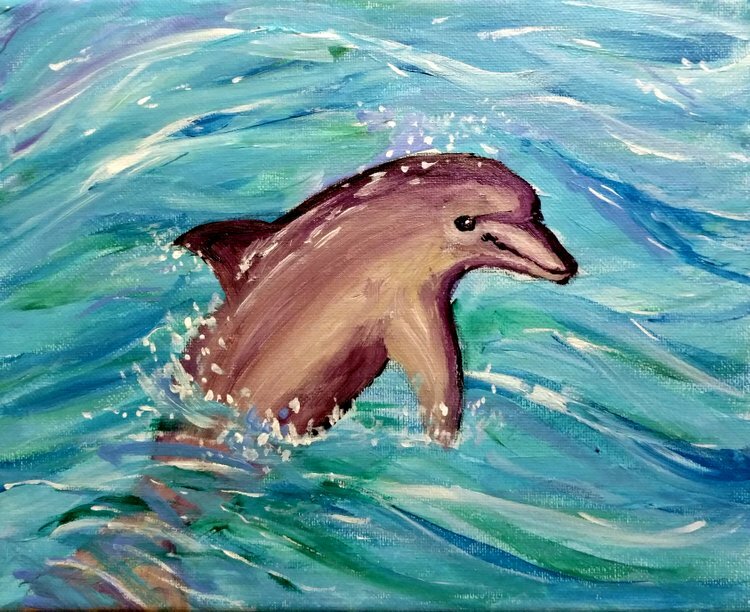 I do have a few of dolphins however, so decided I would paint a dolphin. This is just an 8x10 on stretched canvas. I had such fun at my workshop yesterday. I finished my sea turtle painting with over two hours to go, but had forgotten to bring a second canvas. My friend Kay, though, graciously gave me an extra 8x8 small square canvas that she had and it seemed perfect for a close-up portrait. 1) I was working from a very small reference photo without strong facial details. 2) I've never painted a sea turtle before so have no clear mental image of what they should look like. So this was actually a bit of the struggle. As the instructor said "He looks a bit like an alien". But it was really more the water I cared about than the turtle anyway, so it was still fun. What a fun day today. 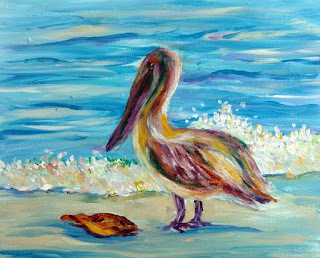 I took a one-day workshop on painting sea turtles and water with Gloria Clifford, who specializes in tropical and sea creature art. 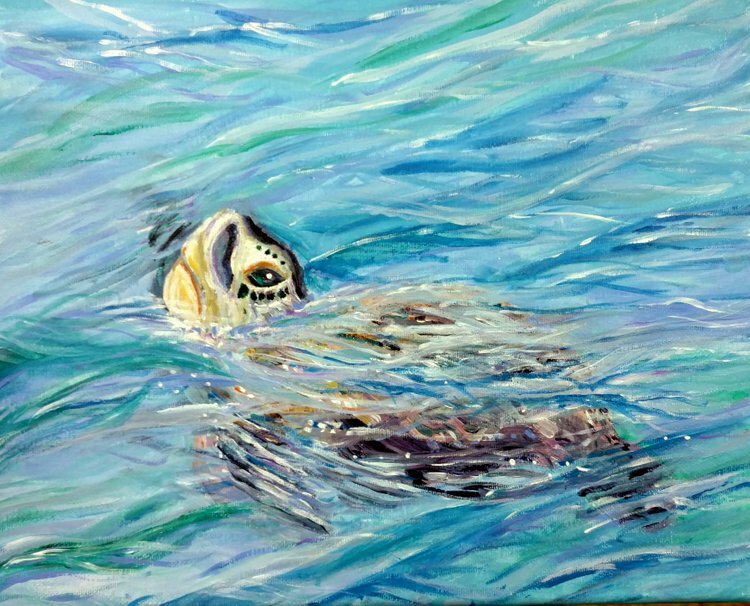 I've never painted a sea turtle before, but I do love water although I struggle with it, and I'm always happy to learn more about it. Gloria was wonderful, and very much an intuitive painter, as I tend to be also, rather than one following all the classic "rules" of painting. She made the day a lot of fun, even for those of us struggling with the water and turtles. This was my first painting, done on 11x14 stretched canvas. 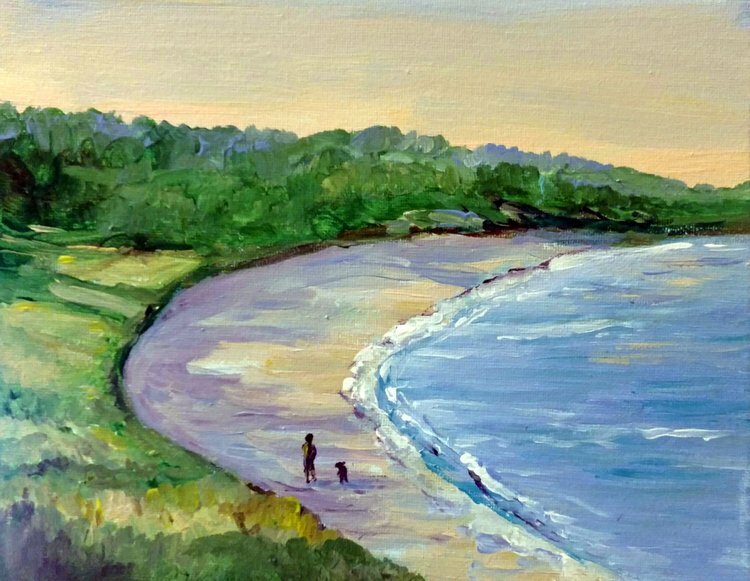 Another 8x10 acrylic, done from a photo I took during a walk on the beach. 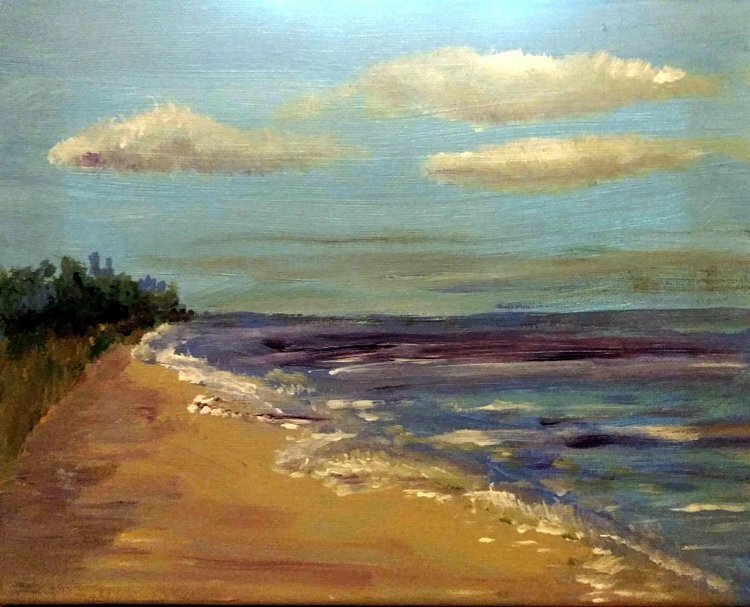 I never get tired of the beach and could easily do beach scene paintings all the time! I need to sort through all my (thousands) of photos and see if I find other references I like. 1) The horizon line was too harsh and dark. This is easily correctable if I choose to do it. 2) The lines of incoming wavelets are too perfectly straight, as if I'd drawn them with a ruler; not quite the way they are in real life. I tried to correct both of those things with my acrylic, but I'm still less than happy with how it turned out. Still, as they say, you can't hit a home run every time. It was still fun to do. LOL, I had a reference photo all picked out and sitting on my table - with oranges and golds, that I was going to paint for my next project, as a change from the cool colors I'd been doing. Then, the morning I sat down to paint, the reference photo was gone! I looked everywhere. It had been sitting on top of the table and I had not touched a thing, but there was no photo there. As I scrabbled around I did pull up a reference for the scene about, always one of my favorite scenes, so I painted this instead, another 8x10 acrylic. The funny thing is that this is the third time I have painted from this exact same reference, all small. 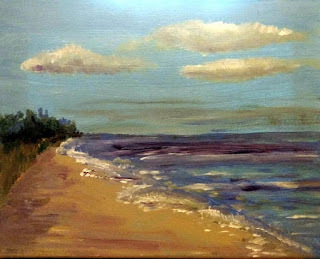 I first did it as a small 6x9 pastel here, and then again I tried it as an 8x10 acrylic here. That was one of my very first acrylics when I was just beginning to dabble in them. 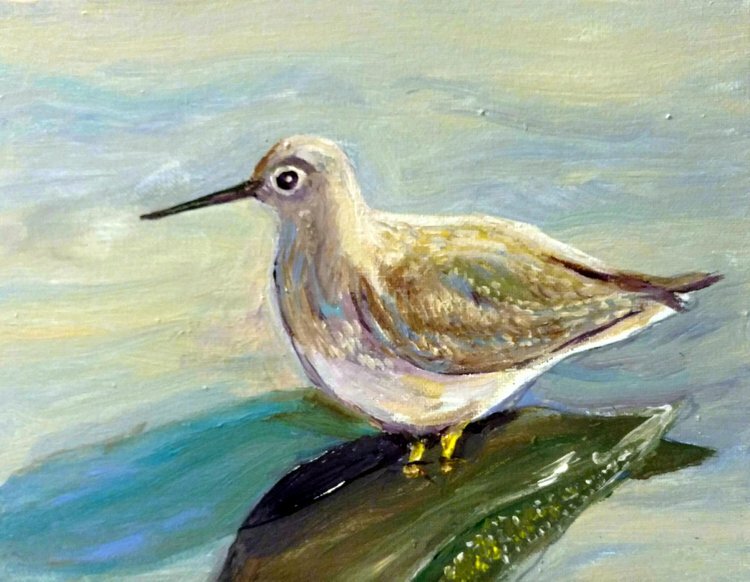 Well I still feel like a dabbler since I've had no formal training in acrylic, but I'm enjoying them a bit more now. This is a scene down the road from my sister's house in coastal North Carolina. Whenever I visit her I walk my dog down here in the morning. My dog is an early riser so I usually get to see the pinks and violets of the soft early morning light. This is another 8x10 acrylic. I love this spot so much I've even done a couple pastels from this same location, namely here and here. If you stand on the path for those two paintings and turn to face left you will see the scene in the acrylic painting above. This is another 4x12 acrylic. This is sort of a fun size to work with. 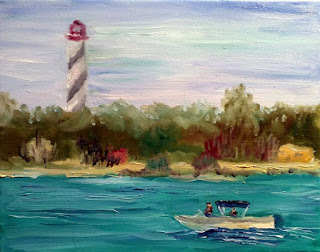 I was at the Fountain of Youth last Saturday with the First Coast Pastel Society, and it was a chilly, windy, blustery day. Not really good for plein air, and the lighting was not so great, but I enjoyed all the peacocks strutting around, took a variety of photos, and enjoyed the 16th century reenactment going on for the weekend. Another small 8x10 acrylic. 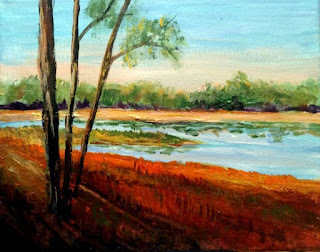 I admit that pastel will always be my first love, but I've been having fun with these small acrylics, and they are great to take to the Starving Artist Gallery since they don't need framing under glass. In fact don't need framing at all since I paint the sides of the canvas too and just present them as gallery-wrapped and helps keep my costs down, LOL. Well I had time for another small 8x10 acrylic this morning. Pastels are my first love, but I've been having a lot of fun with acrylics lately. 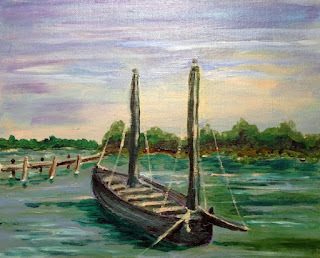 They go much faster than pastels, especially when you are trying to keep things really loose and impressionistic. When a small painting only takes 20-30 minutes it's not too hard to keep up with a one-a-day schedule. A few days I've even done 2-3! 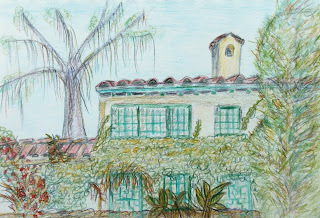 Today the Art Guild of Orange Park had a plein air day at Club Continental. 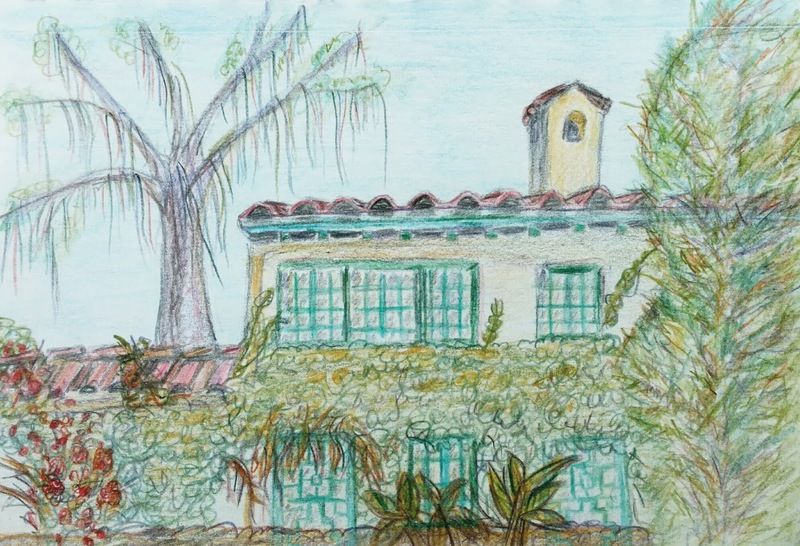 I stopped by but just had my sketch pad with me, so did this 5x7 sketch using my colored pencils. Still working on small acrylic paintings. 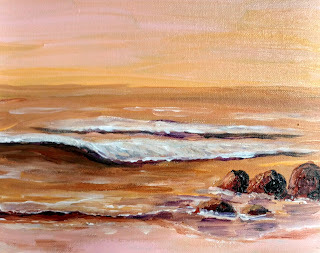 This is my effort for today, a beach with some coquina rocks. This one is also an 8x10. I've hardly done any painting since breaking my wrist last summer, so for the New Year decided I should try to do more. I've been working on some small acrylics since, if smaller, I can do more of them! These are the ones I've completed so far, none with titles yet. Egrets: This one is an 8x10. Moonlight: This one is 5x7. Heron: This one is 8x10. Cardinal: This one is 8x10. 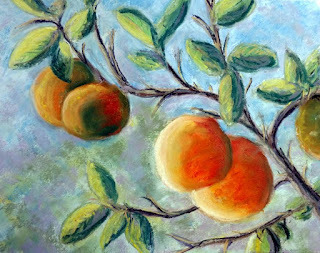 Oranges: This one is 5x7. 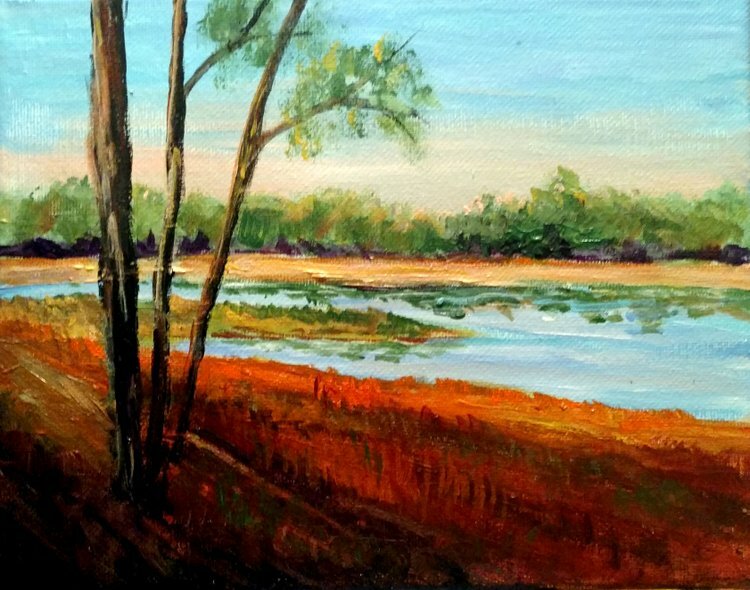 Marsh sunset: This one is 4x12. 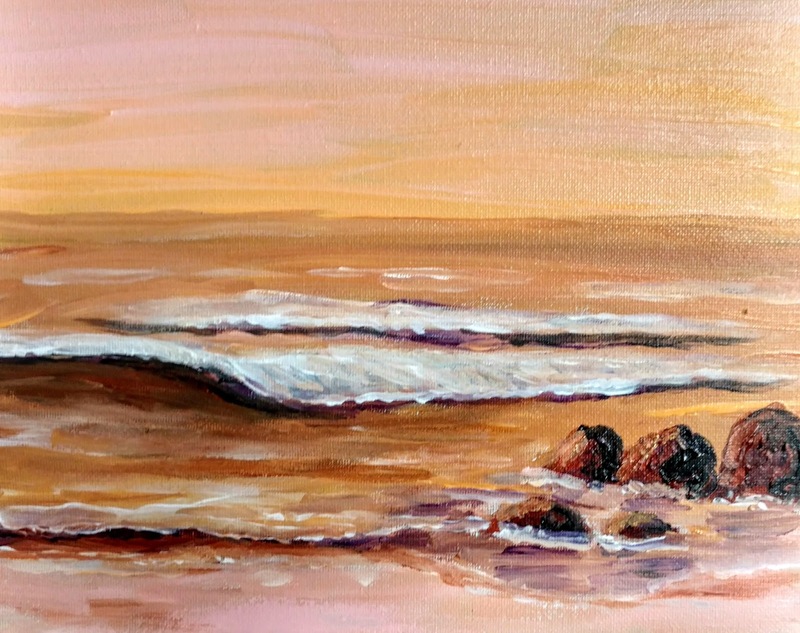 Beach Sunrise: This one is 4x12. Lots of fun! I'm looking forward to more smaller ones. The previous pastel, "Backyard Treasures", was done in order to enter into a prestigious art show the Art Guild of Orange Park was having at the Thrasher-Horne Gallery. I was not crazy about it however, and didn't think it was show quality, so I decided to try it again, this time in acrylic, and see what I thought of that. This is the result, also 11x14. I was not crazy about this one either, but like it better than the pastel. So in the end I entered them both in the show. Surprise! This one was juried out and the pastel was accepted into the show. You just never know. I have a large orange tree in my back yard. Alas it's a bitter orange, so no good for juice, but it is good for making marmalade! The oranges begin to ripen in late October, and do through January or so. I love it when the oranges are ripe though, and the sun shines on them. 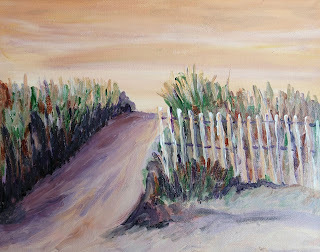 This is my first cut at a painting - done on an 11x14 piece of cream-colored Art Spectrum paper - a mixture of pastels but mostly NuPastel and Terry Ludwigs.